This is reposted from a blog I wrote a couple of years ago, after yet another conversation with a beautiful new mum, who felt stressed and pressured to ‘bounce back’ after having her baby. 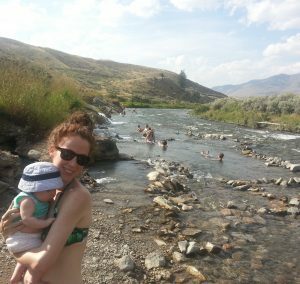 Swimming in a daggy bikini, with a still-very-jiggly body, on a HOT day with my beloved newborn. One of my fondest memories from this period in time. Look at how happy I am! My body shape and size had nothing to do with it. Instead, I attribute the joy captured here to my beautiful baby + good physical and mental wellbeing.